If education is signaling, does moral signaling become a viable major? In a recent post, I encountered an interesting empirical fact about the college wage premium accruing to low-ability college grads over the period 1979-1994. Looking at a 2003 article by Tobias, I wrote: "There is a lot of temporal volatility for the class of low-ability individuals. In fact, for low-ability individuals there is not even a consistent wage premium enjoyed by the college-educated until 1990." I have begun to wonder if this pattern has anything to do with the non-linear relationship between GPA and PC. If the low-ability college entrants feel they are much less certain to enjoy a wage premium over the "townie losers" they left behind, what better strategy than to invest their college-specific word games with extreme moral significance? That way, even the dumbest college grad can be confident that they will remain distinguished from the more able among the non-college-grads. Although this last point is only conjecture, it is curious that right when the wage premium for low-ability college grads arrives is right when the first wave of campus political correctness kicks off — the early 1990s. Especially if you buy Caplan's signaling theory of education, it's not at all implausible that for low-ability college grads their wage-premium is secured primarily through a specialization in moral signaling. A reader/watcher/listener has brought to my attention another paper, which shows that, for college-educated individuals, earnings are a non-linear function of cognitive ability or g — at least in the National Longitudinal Survey of Youth from 1979-1994. The paper is a 2003 article by Justin Tobias in the Oxford Bulletin of Economics and Statistics. There may be other studies on this question, but a selling point of this article is that it tries to use the least restrictive assumptions possible. Namely, allowing for non-linearities. In the social sciences, there is a huge bias toward finding linear effects, because most of the workhorse models everyone learns in grad school are linear models. Non-linear models are trickier and harder to interpret and so they're just used much less, even in contexts where non-linearities are very plausible. A common motif in "accelerationist" social/political theories is the exponential curve. Many of us have priors suggesting that, at least for most of the non-trivial tendenices characterizing modern polities, there are likely to be non-linear processes at work. If the contemporary social scientist using workhorse regression models is biased toward finding linear effects, accelerationists tend to go looking for non-linear processes at the individual, group, nation, or global level. So for those of us who think the accelerationist frame is the one best fit to parsing the politics of modernity, studies allowing for non-linearity can be especially revealing. The first main finding of Tobias is visually summarized in the figure below. Tobias has more complicated arguments about the relationship between ability, education, and earnings, but we'll ignore those here. Considering college-educated individuals only, the graph below plots on the y-axis the percentage change in wages associated with a one-standard-deviation increase in ability, across a range of abilities. Note that whereas many graphs will show you how some change in X is associated with some change in Y, this plot is different: It shows the marginal effect of X on Y, but for different values of X. The implication of the above graph is pretty clear. It just means that the earnings gain from any unit increase in g is greater at higher levels of g. An easy way to summarize this is to say that the effect of X on Y is exponential or multiplicative. Note also there's nothing obvious about this effect; contrast this graph to the diminishing marginal utility of money. Gaining $1000 when you're a millionaire has less of an effect on your happiness than if you're at the median wealth level. But when it comes to earnings, gaining a little bit of extra ability when you're already able is worth even more than if you were starting at a low level of ability. The paper has a lot of nuances, which I'm blithely steamrolling. My last paragraph is only true for the college educated, and there are a few other interesting wrinkles. But this is a blog, and so I mostly collect what is of interest to me personally. Thus I'll skip to the end of the paper, where Tobias estimates separate models for each year. The graph below shows the size of the wage gap between the college-educated and the non-college-educated, for three different ability types, in each year. The solid line is one standard deviation above the mean ability, the solid line with dots is mean ability, and the dotted line is one standard deviation below the mean ability. An obvious implication is that the wage gap increases over this period, more or less for each ability level. But what's interesting is that the slope looks a bit steeper, and is less volatile, for high-ability than for average and low-ability. There is a lot of temporal volatility for the class of low-ability individuals. In fact, for low-ability individuals there is not even a consistent wage premium enjoyed by the college-educated until 1990. More educated individuals generally know more than less educated individuals. If you test what they know about any random political issue, for instance, uneducated individuals are more likely to give an incorrect answer, or say "I don't know," relative to more educated individuals. At first this sounds obvious, but what if the correct answer to a question is that we don't know? If you think that the purpose and main effect of education is to increase a person's store of true information, then an educated person should be more likely to say "I don't know" when asked what they think about an objectively unknown or uncertain matter. But what if education does not increase one's store of objectively true information so much as it increases one's familiarity with respectable or high-status opinions? That is, education may primarily educate one about what educated people feel and believe. In this model, education is mostly about gaining familiarity with the ideas and gestures that are valued by the already educated classes, and having some dedicated time to practice mimicking them. Getting educated is not really about developing a fuller or more accurate model of the world, it's about learning to pass as a member of the education club, to get hired by employers who obtained their employment power through their own educated credentials. If this is the case, then it's possible that more educated people would be less likely to admit "I don't know" in the face of really-existing uncertainty, and would be more likely to say whatever they think other educated people would be most likely to say. It recently occurred to me that perceptions about Trump provide a nice opportunity for exploring this question empirically. For someone who is so ideologically polarizing, Trump is ideologically ambiguous. Yet, educated opinion seems to be that he is a major reactionary — even fascist perhaps. Either I'm incorrect in my sense of what educated opinion is, or this is perhaps a case where the educated tend to be in agreement — incorrectly. First, we should establish what is objectively known about Trump's ideology (especially what was objectively known around November 2016, because the survey data we'll explore were gathered at that time). For the bulk of his adult life as a public figure, he was a moderate Democrat. As discussed in Bob Woodward's recent book Fear, this was taken very seriously in the early days of his campaign strategy discussions. “You’ve got some problems on issues,” Bossie said. “First off, there’s never been a guy win a Republican primary that’s not pro-life,” Bossie said. “What’s that?” Trump asked, seeming a little more wary. “Well,” he said, “80 percent of the donations that you’ve given have been to Democrats.” To Bossie that was Trump’s biggest political liability, though he didn’t say so. “There’s public records,” Bossie said. 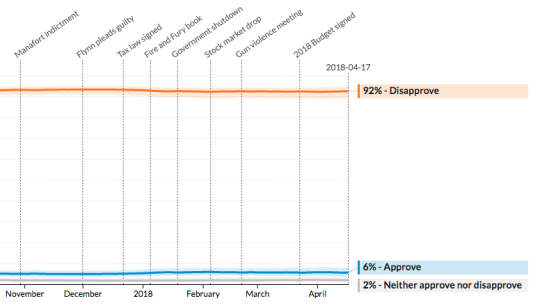 In a November 2016 article entitled, "We’ve Never Known Less About An Incoming President’s Ideology," Harry Enten of FiveThirtyEight presents the table below. Donald Trump is the second-least conservative Republican President in the last 40 years (only GHW Bush was more moderate than Trump). I went and wrangled the 2016 Cooperative Congressional Election Study dataset, which has been one of the most common sources of data for many of the buzzy analyses you might have read about in the past year or so. 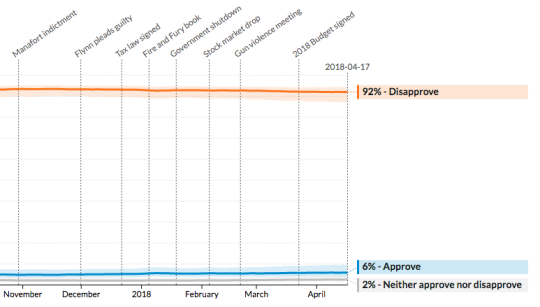 As the figure below shows, the most common perception of Trump's ideology is "I dunno." That's pretty interesting. The second most common is "Very conservative." So given that "we’ve never known less about an incoming president’s ideology," and that one could make a decent data-driven case that he is a moderate Democrat or a moderate conservative, it seems to me that "Not sure," was arguably the most objectively correct answer. "Somewhat conservative" and "Middle of the Road" also seem like arguably correct answers. But the fashionable perception of Trump as "very conservative" is, as far as I can see, basically incorrect. If this was a quiz and I had to grade it, I would be inclined to mark the answer "conservative" as wrong, too, given Trump's significantly left-leaning policy positions and his history as a pro-choice Democratic Party supporter. 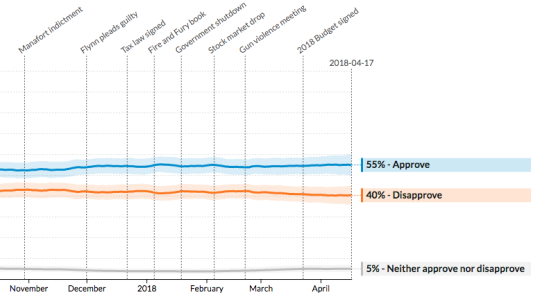 When you look at perceptions of Trump's ideology by education level, as shown in the figure below, you can see that education is negatively correlated with uncertainty ("Not sure," the pink bar all the way to the left). This would be unremarkable for most survey questions, but given Trump's unique ideological ambiguity in November 2016, this pattern may reflect how education has more to do with demonstrating knowledge of respectable beliefs than with analytical or empirical sophistication. In the above graph, it's difficult to eyeball the other proportions. So let's zoom-in on the arguably most correct, uncertain answer and what I take to be the respectable/fashionable but incorrect answer (that Trump is either plainly "conservative" or "very conservative.") 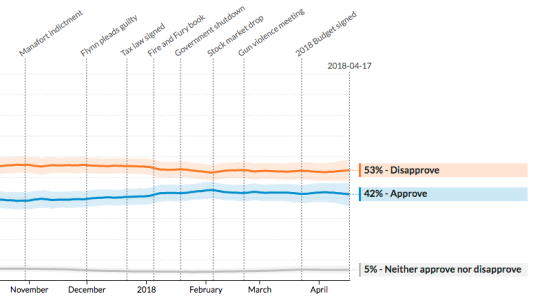 In the figure below, it's easier to see that education is not only associated with a clear decrease in reasonable uncertainty but a modest increase in the fashionable view that Trump is clearly conservative. Post-grads are not much different than those who have minimal contact with college life, but finishing high school and having some college experience are both associated with clear bumps toward the view that Trump is clearly conservative. Overall, these data are not very strong evidence of anything, but they do give a little indication that I may be onto something with my hypothesis — that education may, in some cases, be associated with less correct beliefs. A larger hypothesis might be that, in any context of increasing uncertainty, there will be more and more margins at which the less educated are accidentally more sophisticated than the educated. The correlation between education and support for Trump is very different across the black-white divide. The graphs below I have taken from Civiqs. And for black postgraduates, the distribution of Trump approval is… about the same as it is for black people with no college degree. This surprised me. At first I thought there was a glitch in the browser, I had to refresh it for the different subsets to make sure this wasn’t a mistake. So what’s going on here? It’s genuinely unclear to me, but there are only a few plausible possibilities. One possibility is that this variation is just an artifact of other variables. But if education does have some effect on attitudes toward Trump, is there a reason why would it would be different for white and black folks? Who knows, but it’s interesting enough to hypothesize about. Scholarly literatures on the relationship between education and political attitudes sometimes debate whether education has an income effect (grads think differently because their market position is different), a learning effect (grads think differently because they have more information or knowledge), or a socialization effect (grads think differently because they enter into cosmopolitan social circles). Which one of these mechanisms could account for an educational effect on Trump support, conditional on race, where education shifts white people toward disapproval while shifting black people nowhere? An income effect is conceivable, in which the better jobs and salaries won by white postgrads makes some of them change their mind toward disapproval of Trump. But other research suggests that income, apart from education, was not really an independent driver of Trump support. A learning effect seems to me unlikely, in part because university education is probably not about learning, but also because I see no reason why black students would be less likely than white students to learn new reasons for disliking Trump. It’s possible that black people are so opposed to Trump that education doesn’t really have much room to exert a unique, additional effect; or that whatever university teaches, black people already know it from childhood, e.g. that White Supremacy is real. So education perhaps only affirms what black people already know; whereas many white children do not know that White Supremacy is real, but university teaches them the error of their youthful ways. But if this were the case, it would be unclear why black people bother to attend university; also, you’d have to believe that university teaching is, at least for white students, a hard change of course from 5th grade civics class, to have such an effect; but it seems to me that 5th grade and 15th grade teachers have a pretty unified message that racism is bad and that one should not grab women by their pussies, and that anyone who does or says such things should not be President. I don’t see what exactly university would teach white people that departs from what the education system already taught them. So I don’t see how an education effect could be a learning effect. Personally, my priors are more in favor of the socialization mechanism. What university lecturers teach is not radically different from what 5th grade civics teachers teach, but the club is very different. If you got a 5th grade civics class, everyone you knew got a 5th grade civics class. There is no club. If you go to university, you leave behind the townies who do not go to university. It’s basic sociological knowledge that all clubs use symbols and rituals to distinguish members from outsiders, and members receive a premium of resources, care, and attention from other members. The culture of the university club is best defined by cosmopolitanism. Why cosmopolitanism is the culture of the university, and how the features of cosmopolitanism serve its members, are topics for a separate post. For now, suffice it to say that cosmopolitanism is the opposite of chauvinism, nationalism, aggression, etc. Cosmopolitanism is the sublimation of these drives into polite speech, which conquers inferiors through competitive subtlety rather than competitive… competition, which is brutish and too obvious. Anyway, it seems plausible that entry into the cosmopolitan social club would have a significant effect, in the direction consistent with the data: away from Trump. But why would the socialization effect be conditional on race, when above I argued there’s no reason a learning effect would be conditional on race? Well, I think there’s a good reason that university would socialize white students into Trump disapproval, while having no such socialization effect on black students. Cosmopolitanism includes compassion for the weaker ‘other.’ As black people in the United States suffer disproportionately from poverty and other ills, white students who enter the university club must become more compassionate toward America’s oppressed black population — as a ritual requirement of membership, mind you, not for any reason that has to do with information, knowledge, or learning. Black students who traverse the university system might become more compassionate for female garment workers in the Global South, but membership in the university club does not require them to increase their expressed compassion to black people in the United States. On the contrary, cosmopolitanism gives them an increased sense of their deserved seat at the table. In short, the cosmopolitan or extra-civilized gain symbolic power over the less civilized, by forfeiting their right to brute force, investing in the social club of advanced symbolic manipulators, and cultivating their symbolic facilities in lieu of their brute force facilities. The more ridiculous social justice fashions today — sometimes led by students of color and supported secondarily by white 'allies’ — are no better or worse than than social justice fashions popular among the educated white elite of any previous generation: cosmopolitanism always means telling refined fibs to secure resources away from the grabbing hands of those who are unable to tell refined fibs. In summary, I hypothesize that education exerts a socialization effect on students, and that such an effect should alter Trump support only in the case of white students. Stay up to date on all my projects around the web. No spam, don't worry.